Hamilton Beach Brewstation Summit Ultra 12 cup Programmable Coffee Maker. One hand dispensing so your last cup tastes as fresh as the first cup. 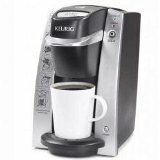 This coffee maker has several brewing options making it one of the most versitile on the market. Choose from bold, regular, iced coffee or small batch options.